So I have a camper, it has a projector screen and a portable projector. I have been trying to decide the best way to watch films and TV while out in the middle of nowhere camping. The easy and obvious option is to just use a big USB stick, download media before we go and have it plugged into the side of the projector. However I would prefer not to need to spend an afternoon planning what films and TV we may want to watch over the next week before we go and then be limited to only the things I have pre downloaded when we are away. I want to use a Pi as a mobile media centre that I can use to access TV and films using my phone as a hotspot. It would also be nice to have an additional Pi running game emulators so I can switch between the two using the projector as the display. My ideal set up would also include an additional touchscreen interface which could be used to control the media centre. The gaming Pi can run straight to the projector and be controlled by a bluetooth gamepad. 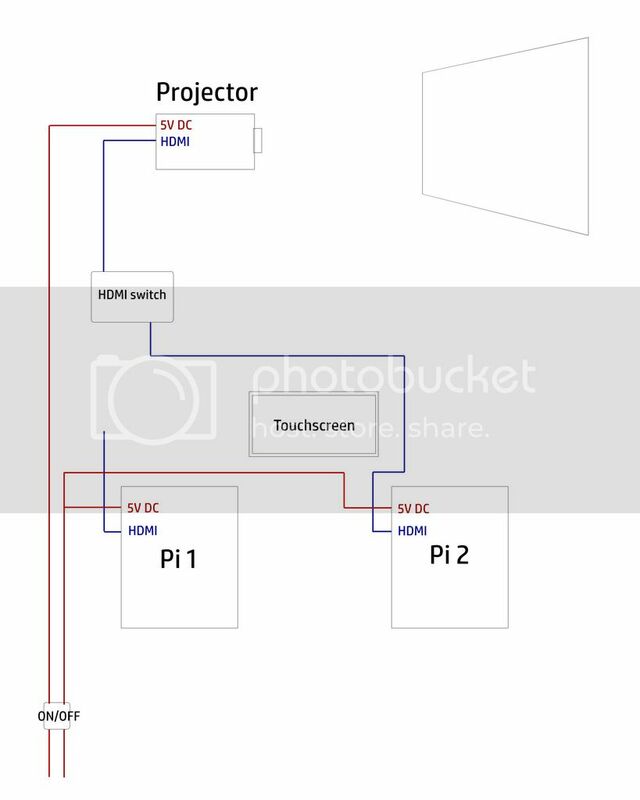 - Is it possible to have a small touchscreen interface as a separate display so menus, play/pause/back/forward/volume controls are on the touchscreen and the video is playing on the projector? - What small touchscreen would you recommend if its possible? - What bluetooth gamepads would you recommend? - Am I expecting far too much from a couple of £30 computers?! - Kodi is still the master of media centers. - Where do you intend to store the media you want to play ? You could test that out before ordering the HDMI switch and the extra Pi. Pardon the question, but... Why bother going camping if you're only going to watch the idiot box? If your relying on online resources such as netflix bbc etc i think you would be much better served with a chromecast stick and your mobile phone as an interface device, quick n easy to test/check within distance selling return periods.. . Imho a Pi media centre would shine with a local repository of media supplemented with online resources. I use this setup and it works great! Thanks for the responses, mostly helpful. Given me a few more things to think about. Good shout using the phone as the interface, as usual I am trying to overcomplicate things! I used to have a Pi2 hooked up to my TV running Kodi and had very few issues streaming films and TV shows plus my projector is 720p max so I’m not going to be pushing it that hard. Will hook up a basic version of what I want and trial it I think, Im sure I can find another use for the Pi if its terrible. If it works well Ill move on to integrating it into the van properly. Thanks for the advice.